This gallery contains pictures of the temple of Horus, the falcon headed god. The temple, which is located in the Egyptian city of Edfu (Idfu), was built during the Ptolemaic period and construction began in 237 BC by Ptolemy III Euergetes I and was completed in 57 BC. This is not only the best preserved ancient temple in Egypt, but also the second largest after Karnak. The main building, which includes a great Hypostyle Hall, was uncovered by the archaeologist Mariette in the 1860s. 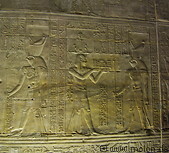 There are numerous reliefs, including a depiction of the Feast of the Beautiful Meeting, the annual reunion between Horus and his wife Hathor.